I am a massive drama geek, to the bone I am a drama nerd. I yearn for the stage and I love to be in the spot light, always will I bet. So of course I really wanted to showcase some of the true theatre awesome we have here in Vancouver, especially the incredible man behind our famous Bard on the Beach. Truly a spectacular thing to go an enjoy by yourself, with your hubby and especially your kids. I think the best way to introduce any young adult to Shakespeare in a way that they can’t NOT fall in love with it, is via Bard on the Beach. So today I am bringing to you, my wonderful interview with the awe inspiring Christopher Gaze! 1. 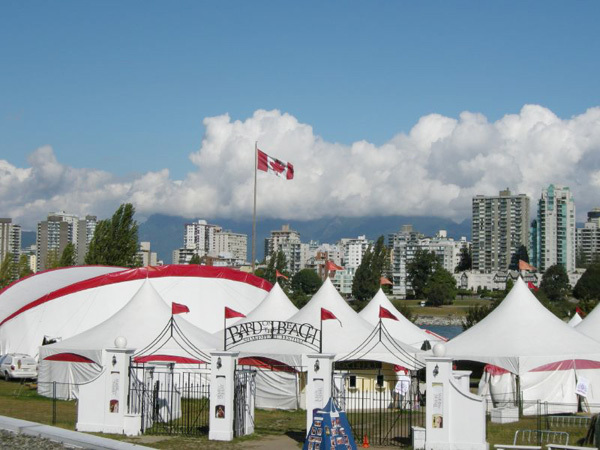 What has been the largest reward from founding Bard on the Beach here in Vancouver? To welcome 85,000 to 90,000 people every year to see top quality Shakespeare and to see families embrace the Bard experience and feel as passionate about it as I do. 2. What has been one of the most memorable performances you have ever given/seen with Bard on the Beach? What made it so special to you? To see Bard actors excel and become great. Alessandro Juliani as Feste in 2002. Bob Frazer as Hamlet in 2005. To watch Dean Paul Gibson and Meg Roe develop at Bard. To watch year after year such stellar performances from Scott Bellis, David Marr, Allan Morgan, Lois Anderson, Colleen Wheeler, Andrew Wheeler, Naomi Wright, Todd Thomson, Jennifer Lines, Haig Sutherland, Bernard Cuffling, Duncan Fraser, David Mackay, John Murphy, Allan Zinyk – the list goes on…. And this year to celebrate the brilliance of Kim Collier as the director of Hamlet and the astonishing Jonathon Young playing the title role and also Feste in Twelfth Night – they continue to make a massive contribution to Canadian Theatre. 3. Hands down, what is your favorite Shakespearean play? 4. If you could only play one Shakespearean character forever, who would you pick and why? Puck in Dream – he’s mischievous, he’s fun, he has some of Shakespeare’s most beautiful poetry to speak – I played Puck twice in 1980 and 1983. 5. Tell us what it is like hosting Vancouver Symphony’s popular Tea & Trumpets series and their annual Christmas concerts. I have hosted/emceed/narrated literally hundreds of concerts for the VSO over the past twenty years. To sit on stage surrounded by a symphony orchestra is indescribable. I love it and count myself very fortunate. I write or compile all the words I say and have developed an unique and glorious relationship with the audiences. With Maestro Bramwell Tovey’s leadership and the dedicated staff of the VSO we work hard to cherish and honour the loyalty and love of the VSO audiences. 6. What did your mentor say to you to inspire you to come to beautiful Vancouver? Douglas Campbell inspired me to come to Canada in 1975. He was so proud of the creation of the Stratford Festival in Ontario – and he felt that I was the kind of young man that would blossom and flourish as theatre exploded across Canada. The early part of my work in Canada was in the East but I moved here thirty years ago. Vancouver is a gorgeous place to live and I am forever grateful for all the wonders of BC. Heaven on earth! Douglas was my theatrical father and he came to help us many times as Director, actor and friend to all – I loved him very much and miss him dreadfully. But his impact on me and on Bard will carry on for a very long time. 7. Was moving to Vancouver what you hoped it would be when you planned it out in your head? When I moved to Vancouver with my family in 1983 I had no real plan but to continue to work in the theatre. I started to direct as well at that time. But I always knew in my heart that I wanted to take more responsibility for my professional life and I believed that somewhere deep inside of me there was something I needed to do. This all became apparent in 1988 when my father died – it was a dreadful shock but a wake-up call that started to drive me towards taking action. 8. What are something’s that you wish for the future of Bard on the Beach? I hope to be with Bard for many years to come – we have so many plans, so many dreams and so much that we want to do. The quality of work on our stages is spectacular. We want to build the Bard experience – my friend and colleague, Managing Director John McCulloch believes (as do I) that Bard can be expanded into a much richer experience by enhancing what we have to offer on the site pre-show. You can already buy picnics from our caterer or bring your own. You can enjoy beer, wine and cider, tea and coffee, chocolate and so forth – we offer free pre-show talks before every performance – there is live classical music. All this can be expanded and enriched as our patrons discover that you can extend your evening by coming on site an hour before showtime. Bard can truly go from good to great, we have all the potential in the world. 9. What have you loved about introducing Shakespeare to younger generations? I know it was one of the places I fell head over heels for Shakespeare. I love that you loved Bard as a young girl! Our whole intent is to open wide the door of the arts to our children, our grandchildren and to all young people. Through Bard, young people can begin to understand the trans-formative beauty of words, of music, of every aspect of the theatrical experience and begin to explore their creative passions in the world. 10. When you first started Bard on the Beach did you anticipate it’s massive success and a full 23 seasons? Bard is 24 this summer – I believed we could do something remarkable. But I never dreamed that my passion would be shared by so many. I sometimes reflect on our accomplishments – but not for long…. as there is so much to be done. Off to work now – many thanks for your support and interest – you make an exquisite difference Eschelle! Isn’t he fantastic?? I really want you to make plans to have an amazing summer night at Bard on the Beach, I know I will be going to their Hamlet performance. My fav play, with one of my fav Sanctuary characters. I will give you more info on that AFTER the performance… OR if I am lucky enough to interview him as well! Support Vancouver arts, have a date night at Bard on the Beach!! Sounds like an amazing way to see some Shakespeare – hopefully one day I can attend. Thanks for sharing. Oh goodness I would love to attend this – it looks spectacular! I used to go to Shakespeare in the Park in Toronto when I lived there. I hope there’s something like that here in summer. I think MediaCityUK in Manchester does some events in summer – this is inspiring me to check it out more closely!